When I started listing fall cupcake flavors I wanted to make, I shared them with girlfriends for their input. Many of them really liked the idea of pumpkin caramel cupcakes and that made it easy for me to decide what to make for a recent baby shower. This recipe takes a good pumpkin cake recipe where I added caramel topping to the batter for a nice subtle note of sweetness. They baked up perfectly moist where the pumpkin puree really worked well with the caramel topping. For the frosting, I wanted to continue with the pumpkin caramel flavors so I made a caramel frosting to which I added a little pumpkin pie puree. It was just a perfect compliment to the cake and overall, a hit at the baby shower! In a large bowl, whisk together, brown sugar, granulated sugar, butter, and eggs. Add dry ingredients, and whisk until smooth. Whisk in pumpkin puree and caramel topping. Divide batter evenly among liners, filling each about halfway. Bake until tops spring back when touched, and a cake tester inserted in the center comes out clean, 20 to 25 minutes, rotating pans once if needed. Transfer to a wire rack; let cool completely. 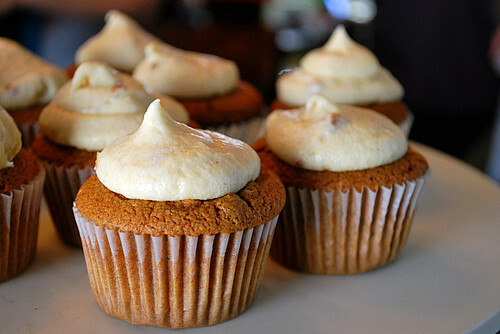 Frost with pumpkin caramel frosting below. In the bowl of an electric mixer fitted with the paddle attachment, add confectioners' sugar, vanilla, salt, pumkin puree, and butter. With the mixer on low, slowly add cream; beat until smooth. If frosting seems too thick, stir another tablespoon cream into the mixture. This is perfect for the coming Halloween. The kids will definitely love the cupcakes. these are too cute! i have a thanksgiving even coming up soon and these would be perfect! 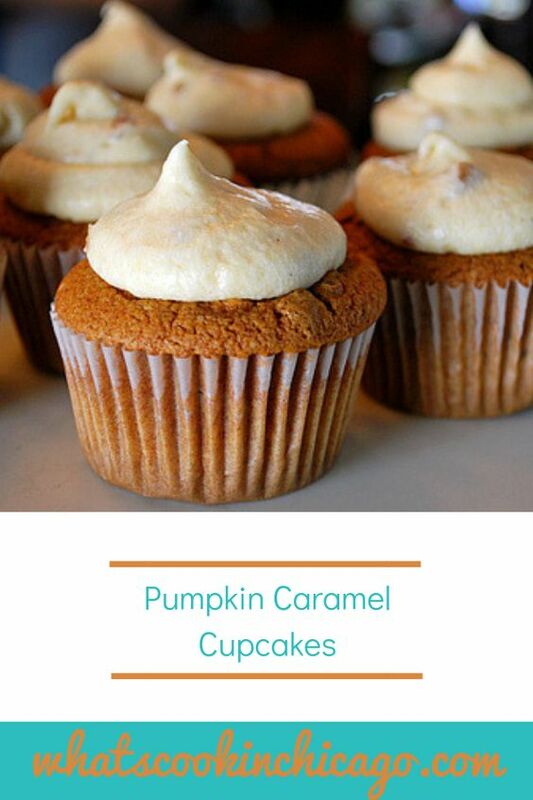 I think I like the idea of pumpkin and caramel better too, especially after seeing your cupcakes. Does your frosting have caramel also? I didn't see it listed. Anonymous - cooking the butter and sugar together until browned is consider the 'caramel' in which the frosting gets its subtle flavor and color. But if it's not enough caramel flavor for you, feel free to add some caramel sauce to sweeten it up!